League Two strugglers Rochdale have announced that they have parted company with manager Steve Parkin and his assistant Tony Ford, by mutual consent. Dale are 22nd in the table after losing seven of their last eight league games. Parkin began his second spell in charge at Spotland in December 2003, having previously managed Dale between 1999 and 2001 before leaving for Barnsley. "Naturally I am very disappointed to be leaving, but I understand it's results that count," he said in a statement. "I take with me many fond memories of my time at Rochdale, and look forward to visiting Spotland in the future to catch up with my many friends." Chairman Chris Dunphy added: "Steve is a true professional and I know how hard he has worked in doing the best he possibly can. "Unfortunately, results have not been what we have all been working for, and sadly we feel the time for a change is now." The ex-Mansfield manager's last game in charge was Friday's 1-0 defeat at Hartlepool. 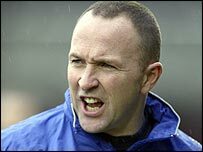 With Parkin and Ford gone, director of youth football Keith Hill will take over as caretaker manager.